NPR spoke to Cheech Marin regarding his Chicano art exhibit at LACMA. Last night, Cheech Marin and Tommy Chong appeared together at the House of Blues for the Sunset Strip Music Festival's tribute to Lou Adler. Lou Adler is a music legend, having produced nearly all of the Cheech and Chong albums, as well as numerous other great albums. Adler also directed Cheech and Chong's first film, Up In Smoke. Yahoo posted photos taken by the Associated Press. If anyone has video footage, please let us know. The trailer for Cheech Marin's new film, A Perfect Game, has been posted. In 1957, a barefooted, rag-tag team of boys from poverty-stricken Monterrey, Mexico defy extraordinary odds to become the first foreign team to win Little League World Series - doing so in a perfect game, the only one in championship history. Based on a true story, THE PERFECT GAME tells the tale of how their miracle changed not only their lives, but an entire city's destiny. This wonderful multicultural children's book is the second of a series of books, written by actor and comedian Cheech Marin. Illustrated by Orlando L. Ramirez and published by Harper Collins/Rayo. The Cheecharrones, the kids who ride on Cheech's school bus, are challenged to a boat race. Ever try turning a bus into a boat? iFMagazine interviewed film composer George S. Clinton. He got his start in film composing after Cheech and Chong saw his band playing at a club in Hollywood. They came backstage afterwards and asked him to score Nice Dreams. He worked with Cheech and Chong again in The Corsican Brothers, where he made cameo as a balladeer. Clinton went on to do numerous movies including Austin Powers and Harold and Kumar. 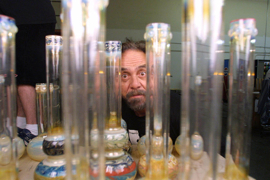 On Sunday, Cheech unveiled a scaled down version of his Chicano Visions art exhibit at the Los Angeles County Museum of Art. This is a short clip of Cheech Marin's lecture. Season One of Nash Bridges, the show which starred Don Johnson and Cheech Marin as cops, is finally coming to DVD. No official release date has been set, but bonus materials are being prepared by CBS. Cheech will be part of the Nash Bridges DVD project. Nash Bridges ran for 6 years beginning in 1996. Update: Release date is October 14th. The legendary comedian, George Carlin, died of heart failure yesterday. George had a history of heart problems. Tommy Chong appeared on Fox-TV's George Carlin Show in 1994. We will try to get comments from Cheech and Tommy on Carlin's passing. We spoke to Cheech Marin earlier today. Cheech said he's "sorry to see him go. He was a great comedian." Tommy Chong told the Associated Press "He made us look at things, look at ourselves. You won't find too many comics with the kind of chops to do that. You're only allowed to do that when you've paid your dues." Update: Tommy Chong informed us he will also be saying a few words at the event. Cheech and Tommy at the same event, how cool is that? It’s one of the most legendary and notorious places in the world—a stretch of blocks where the clubs gave birth to an unforgettable musical revolution. And to this day, fans on the Sunset Strip enjoy top-tier and cutting-edge talent in clubs that are all within walking distance of each other. The Strip’s rich history, contemporary edge and sizzling atmosphere will be celebrated with the first annual SUNSET STRIP MUSIC FESTIVAL, a three-day event set for Thursday, June 26, Friday, June 27 and Saturday, June 28 in the City of West Hollywood. It is intended to promote, preserve and perpetuate the Sunset Strip Music Experience, which thrives today in clubs and theatres like the Roxy, Whisky A-Go-Go, the House of Blues, Viper Room, Key Club and the Cat Club—all of which are uniting for the festival. A collaboration with the Sunset Strip Business Association, Sunset Strip music venue owners/operators and the City of West Hollywood, it is expected to draw 9,000 consumers, fans, VIPs, auction winners and music industry leaders. Legendary music from the past, present and future will shake up the notorious 1.3 mile stretch during the festival. The music lineup will be announced in the coming weeks. Launching Thursday, June 26 at the House of Blues with a celebrity kick-off event emceed by Sugar Ray frontman/Extra host Mark McGrath, the festival will first pay tribute to Mario Maglieri, Lou Adler and Elmer Valentine, all music industry icons connecting the Sunset Strip to its past, present and future. The event will feature Michelle Phillips, Cheech Marin and other special guests. It will culminate with a musical performance by a major act. Performances by exciting artists will take place in the famed Sunset Strip establishments Friday and Saturday evenings (June 27 and 28) from 8:00 PM – 2:00 AM. An “Icon Roundtable” discussion moderated by CNN’s Larry King and comprised of music legends and industry experts will occur earlier Saturday evening. From Bruce Springsteen’s now-classic 1975 performances at the Roxy to The Police’s explosive reunion show at the Whisky in early 2007, shows on the Sunset Strip are more than mere gigs—they’re experiences music fans carry with them for a lifetime. Night after night, no other music neighborhood in the world promises fans the choices that the Sunset Strip has to offer. On a recent weekend, music lovers had the opportunity to check out country legend Dolly Parton, rappers Too Short and Bun B, punk giants Pennywise, plus a showcase of rising metalcore bands, all in the same vicinity. Celebrating its amazing musical history, which originated with the likes of Nat King Cole before bolstering performers from the Rat Pack to The Red Hot Chili Peppers to superstardom, the Sunset Strip’s evolution was augmented by the sonic revolution of the late 1960s. Acts like The Doors (who were the house band at the Whisky in 1966), The Byrds, Buffalo Springfield, Frank Zappa and Jimi Hendrix changed the face of rock & roll while performing in staggeringly close proximity to one another. In the 1970s, artists like Van Halen, Prince and David Bowie catapulted to stardom and reached multi-platinum sales due to the strength of engagements on the Sunset Strip. When L.A. punk blossomed around 1980, The Strip was home to X, The Germs and Black Flag before hard rock giants like Motley Crue, Guns N’ Roses and Jane’s Addiction took flight. In recent years, a new crop of bands—like Weezer, The White Stripes, Maroon 5, Silversun Pickups and Pussycat Dolls—have achieved mega-stardom after first getting their legs in area venues. The Sunset Strip’s renowned establishments have helped sustain the most storied music neighborhood in existence, a notion chronicled over the years on releases like Bob Marley & The Wailer’s 1976 recording Live at the Roxy; X’s Live at the Whisky (1988); Tupac Shakur’s last recorded live performance from 1996, Tupac: Live at the House of Blues; Social Distortion’s Live at the Roxy (1998); Pennywise’s Live at the Key Club (2001); and Brothers of a Feather, the 2007 CD and DVD release from Chris and Rich Robinson of The Black Crowes at the Roxy. Stay tuned for more announcements about the first annual SUNSET STRIP MUSIC FESTIVAL. Visit www.ssmf.com or www.myspace.com/sunsetstripmusicfestival for more info. The WORLD PREMIERE of Disney•Pixar’s WALL•E, opening nationwide June 27, 2008. What if mankind had to leave Earth, and somebody forgot to turn the last robot off? WALL•E spends every day doing what he was made for. But soon, he will discover what he was meant for. From Academy Award®-winning writer-director, Andrew Stanton, Disney•Pixar’s WALL•E is the heartfelt story of one robot's comic adventures as he chases his dream across the galaxy. Rated G.
Just when you thought there were no more decades left to love, VH1 is back at it with an all-new 8-part series "I Love The New Millennium." From "Thong Songs" and Big Fat Greek Weddings, to wardrobe malfunctions and the "Big Mouth Billy Bass," it's all here, and our expert team of celebrities, musicians, actors, athletes, journalists and comedians are back to tackle every hard hitting issue you can imagine. For example: Where were all those weapons of mass destruction anyway? How did people watch television before TIVO? Who decided that trucker hats weren't just for truckers anymore? And perhaps most importantly of all ... who let the dogs out? Premiering on Monday - Thursday, June 23-26, at 9PM* and 10PM* each night, VH1 will once again tap our collective memories and revisit the good, the bad, and the funny from the new millennium. VH1 loves the 00's so much that we couldn't even wait for them to end, bringing viewers the first 8 years of the decade (2000 - 2007.) In typical "I Love the" style "I Love The New Millennium" will leave no stone unturned through clips from sitcoms, movies, music videos, TV commercials, network news and other sources. Join us as we travel back in time to a time when Brad Pitt was happily married to Jennifer Aniston. Angelina Jolie and Madonna had yet to start the mad adoption craze and Britney Spears still had her s#!t together. "I Love The New Millennium" has a variety of music artists, TV and film stars, athletes, journalists and other celebs who lend their hilarious perspective to the series including "President Bush," Gina Gershon, Johnny Fairplay, OK GO!, Michael Ian Black, Hal Sparks, Shanna Moakler, Andrew WK, Natasha Bedingfield, Plain White Ts, Perez Hilton, Emmy Rossum, Jared Fogel, Efren Ramirez, Vanessa Carlton, Jenna Von Oy, Ron Jeremy, Dee Snider, Chris Jericho, Shaggy, Angie Stone, Taylor Dayne, American Chopper, Tommy Chong, Lifehouse, Amy Lee, Gilbert Gottfried, Rich Eisen, Kat Von D, Stuart Scott, Beth Littleford, Colton & Aboud, Danica McKellar, Lonny Ross, Michael Emerson, Mya, The Bravery and many more. For more info on "I Love The New Millennium" viewers can go online to millennium.vh1.com for exclusive video content of interview rants and selects from the show. "I Love The New Millennium" is a production of VH1, with Pat Twist serving as Series Producer and Karla Hidalgo, Jeff Olde and Shelly Tatro as Executive Producers for VH1. Cheech Marin speaks about his art collection with KPCC's Adolfo Guzman-Lopez. We've posted a partial list of Tommy Chong book signings (see Current Events on the right). He'll be signing his new book Cheech & Chong: The Unauthorized Autobiography. On August 13th, Tommy Chong will present a reading from his new book, Cheech & Chong: The Unauthorized Autobiography. Josh Gilbert, director of the documentary A/K/A Tommy Chong, will be be hosting the event. 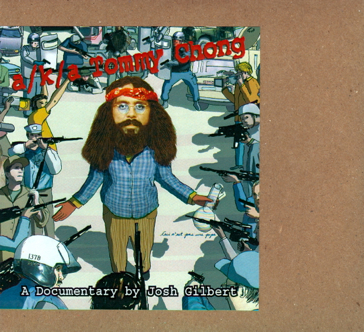 Ever since the feds confiscated 10,000 of the A/K/A Tommy Chong DVD from the distributor, we keep selling out. After you watch the film, you'll realize why the feds didn't want you to see it. A scaled down version of the Cheech Marin's Chicano Visions opens at the Los Angeles County Museum of Art this Sunday. According to Cheech, "With LACMA, it's been love-hate toward the Chicano community since the beginning. We've always been treated as the stepchildren. But I think that attitude is turning around now. They can't ignore us anymore." We have a new low price on Cheech and Chong's Things Are Tough All Over DVD. It's now $12.99. We've also dropped the price on the re-mastered and recently re-released Sleeping Beauty and Let's Make A New Dope Deal CDs. They are now $10.99 each. Update: Cheech will be part of the Nash Bridges DVD project. Tommy Chong posted animation for their legendary bit "Dave" on his LiveVideo channel. 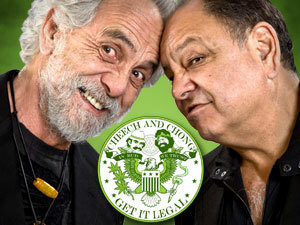 Tommy and Shelby Chong are in Jacksonville this weekend to perform at the Comedy Zone. First Coast News interviewed Tommy. He reiterates that he and Cheech are reuniting. He says he knows he's said this before, but it's for real this time. Tommy Chong had a live video chat last night and posted videos on his brand new LiveVideo channel. Tommy and Shelby talk about Tommy's 70th birthday party. A lot of people ate the "brownies." Shelby revealed that Cheech and his girlfriend, Natasha, attended his party. She accidentally revealed that Cheech and Tommy will be going on tour, doing stand-up together. They will be doing their greatest hits. Shelby will be the opening act. The tour starts in September. Tommy's new book, Cheech & Chong: The Unauthorized Biography, comes out in August. Tommy's also working an animation project with Lou Adler's (director of Up in Smoke and their albums) animation company. They also plan on doing a new movie. Celebs for Kids comes out swinging with a new line-up of stars at the inaugural Launch Party at The Sutton Place Hotel starting on June 6th at 6pm! Following the Launch Party will be Vancouver's premier celebrity charity golf and poker tournaments August 14th and 15th, 2008. NHL Hall of Fame Goaltender Grant Fuhr hosts the inaugural Celebs for Kids events with more than fifty stars of sports and entertainment participating. Paul Nijjer, Director of Sales at Golf BC said, "Together with Grant Fuhr we're committed to creating a world class golf event that brings together many of the best celebrity players in golf," "We welcome our great host Grant Fuhr back to Vancouver, BC." "It's all about doing it right, and building an all-star event that works for the players, the fans and Vancouver," said Karim Chandani, Founder of Celebs for Kids. "I'm excited to announce the Lupus and Arthritis Societies and their involvement as our official charity this year. It is especially significant because it's all about the kids and helping to find a cure." "The Lupus Society is thrilled to team up with Grant Fuhr and many local companies to help raise money and awareness for kids with lupus," said Josie Bradley, Vice President of the Lupus Society. Lupus is an acute chronic disease which can lead to organ failure and death. "We're working hard to raise money to launch the first Pediatric Rheumatology Research Chair in Canada, right here in BC. This Chair will help to make life easier for kids living with arthritis or lupus, through the discovery of better treatments and eventually a cure," says Pamela Clarke, Vice President of Development for The Arthritis Society, BC & Yukon Division. "Supporting the Celebs for Kids fundraiser is just one of the many ways you can help to make a difference for children living with the chronic pain of arthritis or lupus." Visit celebsforkids.ca for more details. Celebs For Kids also announced its first celebrity player commitments-World Champion Donovan Bailey, Olympian, Bode Miller, Actors - Gregory Harrison, Alfonso Riberio, Richard Roundtree, Cheech Marin, Fred Williamson, Brian Baumgartner, Dennis Haysbert, Davon Gummersall, LaLaine, Bret Cullan, Chris Potter, Richard Kind, Nancy Cartwright, Gregory Itzin, Football- Seth Joyner, Dwight Clark, Marshal Falk, Roy Green, Thurman Thomas, Baseball - Vince Coleman, Chili Davis, Musicians - Adrian Young, Thomas McClary, and much more. More than 50 stars from sports and entertainment are expected to compete in the 2008 event. Since its inception, Karim Chandani, the Founder of Celebs for Kids, has a goal to raise 3.5 million for the charities; currently he has raised 2.7 million and has attracted dozens of stars from entertainment and sports to help with this event. No word yet on whether Cheech will be involved in the bonus materials. Tommy Chong launched the Tommy Chong Channel on LiveVideo a couple weeks ago. This weekend he posted the Tommy Chong Channel Intro. It's short. There isn't much in this video, but Tommy told us there's a lot more to come including video of him and Cheech at the 30th anniversary screening of Up In Smoke.